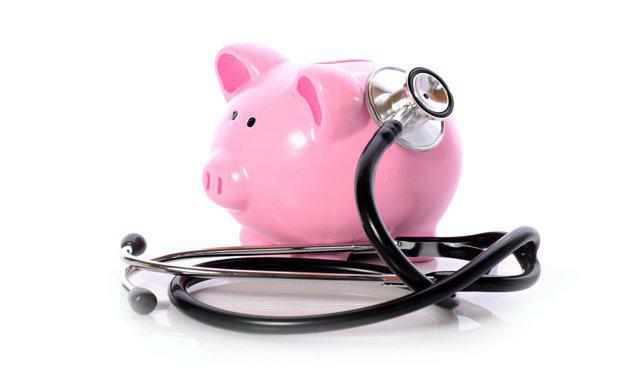 Health Check: How Are Australia's State Economies Getting On? 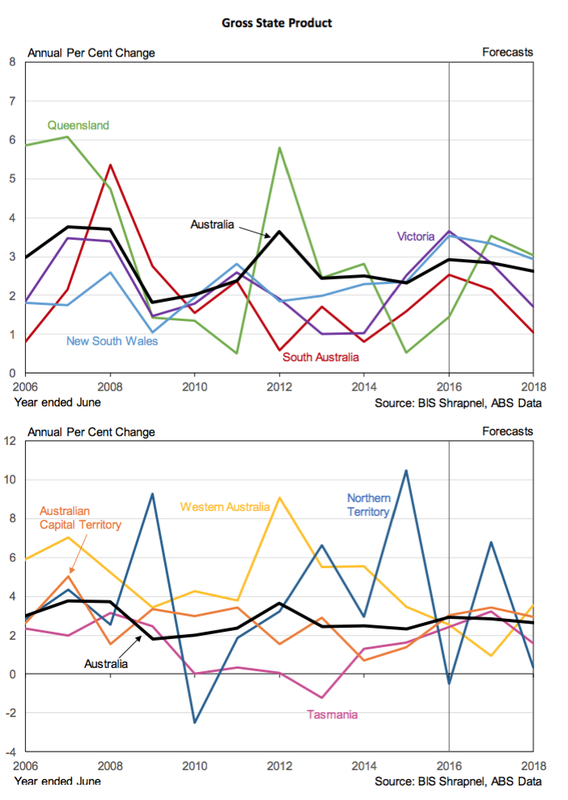 Industry analyst and economic forecaster, BIS Shrapnel have rolled up their sleeves and taken an in-depth look at Australia's economy, breaking it down state by state in their recently released Economic Outlook Bulletin. Their findings revealed that New South Wales is poised to take over the number one spot from Victoria in terms of economic performance among the states over the next two years, and there is still more pain to come for Western Australia, Queensland and the Northern Territory. “This is a major reversal in interstate relativities from just four years ago,” BIS Shrapnel Senior Economist and report author, Richard Robinson said. “For most of the decade to 2012, the mining investment boom saw Western Australia, Queensland and, more recently, the Northern Territory, record by far the strongest economic growth. "Now, with the resources investment boom well into a substantial decline – and with more to come – they have been overtaken by NSW and Victoria. The peak in the mining boom and subsequent falls in both resources investment and commodity prices coincided with the 30 per cent decline in the Australian dollar (against the US dollar). The previously weak states of New South Wales, Victoria, South Australia and Tasmania – whose trade-exposed industries had suffered under the high dollar from 2007 to 2014 – are now strengthening as the increased competitiveness from the lower dollar boosts their key tradeables sectors: tourism, education services, agriculture, manufacturing industries and some business services. New South Wales has the best short-to-medium term prospects of all the states. 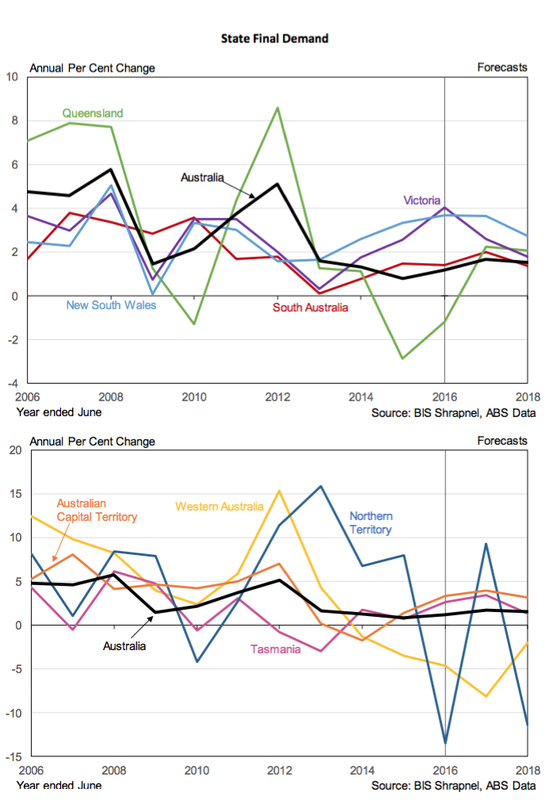 BIS Shrapnel is predicting economic growth to outpace the Australian average and the other states over the next two years in terms of Gross State Product (GSP), State Final Demand (SFD) and employment growth. This positive outlook follows the past two good years, when the NSW economy also out-performed the national average – a marked turnaround from the previous decade or so when the state mostly lagged the national economy. SFD has been growing strongly, increasing 3.3 per cent and 3.7 per cent in 2014/15 and 2015/16 respectively, around 2.5 per cent higher than Australian Domestic Demand growth in both years. There are several positive factors which are expected to drive further strong growth, including employment growth, strength of the labour market and major government infrastructure projects, just to name a few. SFD growth is forecast to be sustained at 3.7 per cent in 2016/17, the same as 2015/16, before growth eases to 2.7 per cent in 2017/18 due mainly to the fall in residential building, with growth remaining well above the forecast national growth in Australian Domestic Demand of around 1.6 per cent over the next two years. GSP growth is forecast to increase by 3.3 per cent in 2016/17, easing to 2.9 per cent in 2017/18. Victoria’s economic growth has picked up pace over the past three years, with SFD growth accelerating from 2.6 per cent in 2014/15 to four per cent in 2015/16, while GSP growth is estimated to have lifted from 2.5 per cent in 2014/15 to an estimated 3.6 per cent in 2015/16 – the highest growth among the states and territories. Meanwhile, employment growth has surged since February 2016, with through-the-year growth climbing to 3.6 per cent in September (compared to September 2015) and pushing the state’s unemployment rate down to 5.5 per cent in August (just below the national average of 5.7 per cent). A key element of this robust economic growth is population growth: Victoria’s population increased 1.9 per cent through calendar 2016, easily the fastest rate of all the states and territories, with very high interstate flows and rising international immigration. Despite healthy population increases, an emerging housing oversupply will become a major drag on growth from 2017, and lead to falls in dwellings investment. Private non-dwelling building and infrastructure investment are set for declines, although rising public investment will partially offset these falls in private construction activity. The shutdown of car manufacturing in late 2017 will have a marked negative impact on overall manufacturing and the whole state economy. The closure of Hazelwood power station next year and potential shutdown of Portland aluminium smelter, plus significant increases in local gas prices, will have further detrimental impacts on Victoria’s manufacturing sector via higher energy prices. Queensland SFD finally increased in the first two quarters of 2016, after declining in seven of the previous eight quarters. However, the worst of the mining slump is now over, with increased government spending and dwellings building (for 2016/17 only) now set to be the key drivers of the domestic economy. State final demand is expected to increase at just over two per cent over the next two years. Meanwhile GSP has stayed positive due to increasing resource and tourism exports, and we expect GSP growth to strengthen from here as the drag from negative SFD reverses and as LNG exports escalate. Queensland’s diversified economy – particularly its strength in the tradeables sectors – will be a key factor in its recovery, but the sharp slowing in population growth, from the boom time 2.6 per cent to 1.3 per cent now, will act as a constraint. Public investment has also been a drag on the Queensland economy, having fallen by over a third over the past six years since the 2009/10 peak, including a fall of 15 per cent over the past two years. However, it is forecast to bounce back over the next two years, led by education-related and other social and institutional buildings, roads, harbours, water and telecommunications-related infrastructure. A sizeable chunk of the funding for this pick-up in activity will come from Commonwealth infrastructure allocations. Queensland state government finances are in relatively poor shape, although state government revenues have benefitted from the residential property recovery and corresponding increases in stamp duties. The recent jump in coal prices and production ramping up on the Gladstone LNG plants, will now also boost government revenues and help underwrite the healthy increases in public investment and government consumption expenditure. Private dwellings investment, which has grown for the past three years, is expected to continue its solid upswing into 2016/17, albeit at a slower rate. However, with the level of dwelling building now well above demand, an oversupply will manifest over 2016/17, driving a sharp downturn in 2017/18. Private non-dwelling building will also decline over the next two years, led by hotels and offices due to oversupply, the latter largely related to the decline in mining investment-related business services, which were a key component of office demand. State final demand in South Australia is forecast to accelerate in 2016/17 to over two per cent, which would be its best outcome since the 3.6 per cent of 2009/10 and well above the dismal 1.2 per cent average of the past six years. Growth will be driven by continued solid growth in household and government spending, offsetting falling business investment and a decline in dwellings investment from 2017/18 (after a temporary rise this year) as the current oversupply worsens. 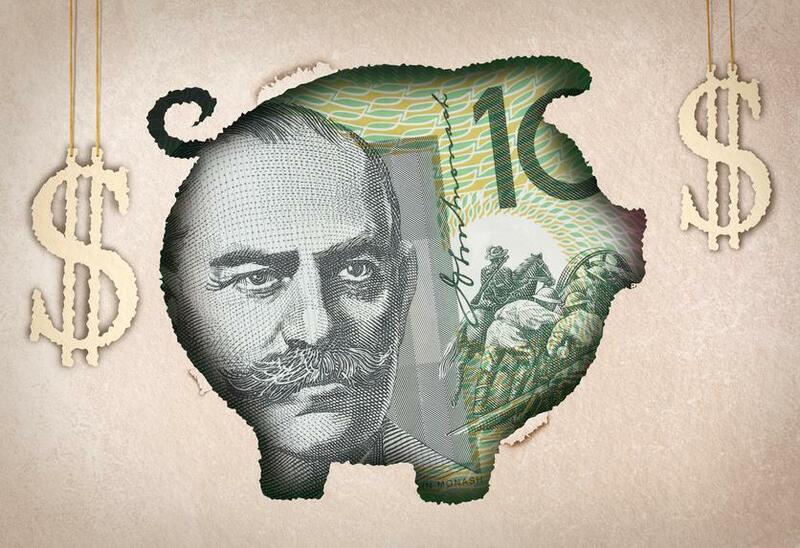 The low A$ and defence projects will continue to be key growth drivers, along with public investment. New public investment rebounded by nine per cent in 2015/16 and is forecast to rise a further 25 per cent over the next two years, led by robust rises in road construction, telecommunications (NBN roll-out) spending, major rail works, a number of projects at the state’s universities, defence facilities and the $140 million Flinders Medical Centre expansion. Note that most of the rise in public investment will come from Commonwealth funding. The state government finances are constrained, with ongoing deficits and debt and a scarcity of public assets to provide revenue or to sell after most of the state’s electricity and ports assets were privatised over the past two decades. Slumping mining investment has resulted in SFD declining over the past three years. Even larger falls in mining investment over the next two years means there will be further and larger contractions in SFD. The downturn still has another three years to run, before bottoming and beginning a recovery from 2019/20. However, moderate growth in GSP will be sustained over this time, due to new mining capacity coming on-stream from the investment boom, adding to exports and more than outweighing the forecast declines in SFD. In particular, new LNG capacity will be a key driver over the next two to three years. Population growth has fallen from 3.6 per cent just four years ago to 1.2 per cent, reversing the flow of net interstate and overseas migration of the boom. That means lower demand for housing. Employment has fallen by 1.3 per cent through the last year to September. GSP grew by an estimated 2.5 per cent last year, held up by mining production. But SFD fell by 4.6 per cent, and is forecast to decline eight per cent in 2016/17. Retail spending is weak, residential building falling, office markets oversupplied and hotels heading for oversupply. Tasmania’s economy has shown a solid improvement over the past year, with SFD increasing 2.6 per cent and GSP estimated to have grown by 2.4 per cent in 2015/16. This follows six years of very weak growth since the GFC, with the state’s economy hit hard by the high dollar which had an impact on the state’s key tourism, agricultural and manufacturing sectors. The momentum of last year is expected to be carried through 2016/17, with SFD forecast to rise 3.5 per cent and GSP increase 3.2 per cent – both above the national average. The key drivers of growth over the next year will be strong growth in both non-dwelling building activity and engineering construction, with solid contributions from government consumption expenditure and higher export growth – the latter boosted by the low dollar and the rebound in products affected by the Basslink failure in 2015/16. However, Tasmania’s economic growth will slow appreciably in 2017/18 as major construction projects are completed and housing declines. The Northern Territory has experienced a high level of volatility over recent years driven by dramatic swings in construction activity and other investment – including residential, non-residential building, public investment and machinery and equipment purchases, but most especially related to work on the $37 billion Ichthys LNG project. SFD increased eight per cent in 2014/15, but then plunged 13.5 per cent in 2015/16 as every segment of private construction and investment activity declined, some quite significantly, while public sector equipment also declined. A strong rebound in SFD and GSP is forecast for this year, then another steep decline in 2017/18 is expected as Ichthys’ construction winds down. GSP should stay positive in 2017/18 as LNG and oil production from Ichthys comes onstream and a lower A$ boosts tourism. The ACT economy staged a healthy recovery over 2015/16, with the very strong growth of 3.8 per cent in the June quarter pushing annual growth in SFD to six per cent (June quarter 2016 compared to June quarter 2015). Year-on-year growth was 3.4 per cent for financial year 2015/16, a marked improvement on 1.4 per cent in 2014/15 and -1.8 per cent in 2013/14. The key driver of growth last year was the 4.5 per cent lift in government consumption (or recurrent) expenditure, as the government’s austerity drive finished. This austerity drive had resulted in little growth in government consumption expenditure over the previous three years, falls in employment and weak household spending. The growth momentum of last year is expected to be sustained over the next two years, and further strong growth is anticipated. However, the surprise increase in dwelling investment last year and into this year is not sustainable. A key driver of growth will be a boom in private non-dwelling construction next two years, led by the Light Rail and electricity projects.